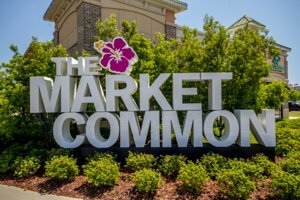 Located on a 114-acre tract of what was once the Myrtle Beach Air Force Base, The Market Common offers you a town-like atmosphere with a myriad of shops, restaurants, events, and even residences that place you right in the midst of this attractive village setting. And with a Charter School, PALS, located on the site, your family will have everything that you need for a comfortable, carefree lifestyle. Once you arrive at The Market Common you may want to stroll around to read the small informational signs that provide you with historical facts about the once-active Air Force Base. Shopping at The Market Common will be an enjoyable way to spend the day or the weekend picking up everything from accessories to apparel and jewelry to home décor, books, music, and sporting goods. You’ll enjoy the landscaped walkways, park benches, rocking chairs, and water features complete with bubbling fountains. There’s a play area for your children and a host of beautiful landscapes where you can take photos during some of the special events hosted by the complex. With some of the most upscale shops included at The Market Common you’ll be dressed to the nines for your next social event or for the gala for your favorite charity. When you get hungry after the movie or your shopping outing, you should enjoy some of the cuisine offered in one of the restaurants at The Market Common. You’ll find a distinctive selection of outstanding choices that serve Chinese, Italian, and American cuisine. From prime steaks to award-winning handcrafted beers to tasty burgers and pizza, your taste buds will be delighted with your selection of meals and snacks. If you’re looking for a retirement home, a primary residence, or your own place in the sun along the Grand Strand, there are single family homes in Cresswind, Emmens Preserve, and Sweetgrass Square to name a few along with two to three bedroom live-work townhome designs for you to choose to purchase. With front porches and traditional Charleston style architecture and colors, you’ll feel as if you’ve moved into the Old South where life is always good. You can choose to live on the water or within a block of the center of town where you’ll be only steps from all of the action of your charming village, The Market Common. From the most comfortable movie theater at the beach to the most refreshing ice-cream along the Grand Strand, The Market Common will have something for everyone in your family. If upscale shopping excites you and the ambiance of a village captures your interest, make the trip to see The Market Common that is rich in history and tradition.